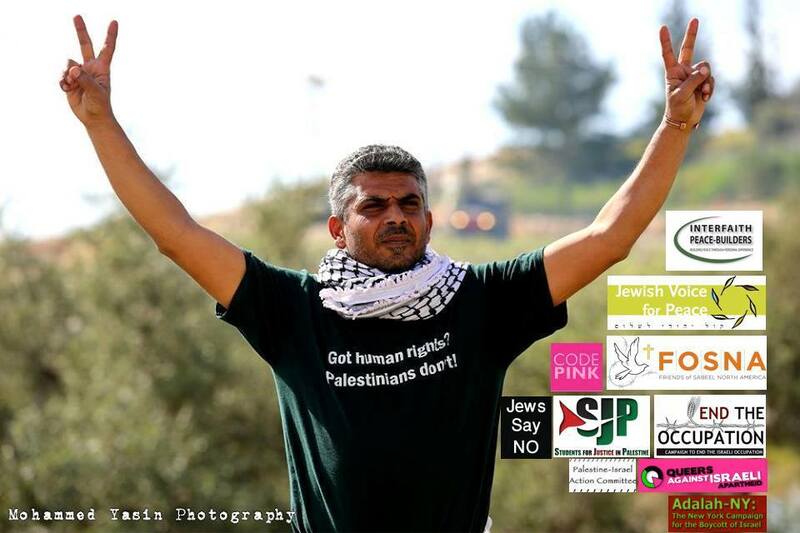 Palestinian activist Iyad Burnat will speak in Syracuse this Sunday, April 19 from 7:00pm – 9:00pm at ArtRage Gallery, 505 Hawley Ave.
Iyad Burnat is the coordinator for the Popular Committee in Bil’in, Palestine, a small farming village seven miles west of Ramallah in the occupied West Bank. For ten years, Iyad and the Popular Committee have organized the people of Bil’in to participate in weekly non-violent demonstrations against the confiscation of their land, destruction of their olive trees, and Israel’s illegal Separation Wall and settlements. This past summer, Iyad’s fifteen-year old son was shot in the leg by the Israeli military, severing a nerve and requiring ongoing medical care. As part of his month long spring 2015 U.S. speaking tour, Iyad will visit Syracuse on April 19th to describe what life is like under Israeli occupation, his village’s ongoing struggle for justice and freedom, and what inspires him to continue non-violent resistance.